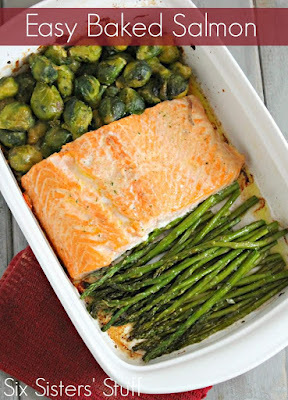 Our Easy Baked Salmon is a complete meal in one pan. Full of protein, omega-3s and two vegetable sides, it's a healthy dinner you'll make over and over again. We love this recipe for a few reasons: It’s one of the easiest recipes to make (it’s practically fail-proof) AND it’s a main dish and side dish in one pan, which means less dishes to clean up. Plus, with good-for-you foods like salmon, Brussels sprouts, and asparagus – it is a very healthy meal. If you’re afraid of the idea of baking salmon, don’t worry – we have some awesome tips for before you get started. Place the salmon skin side down in the middle of the pan. Cook brussels sprouts as directed on the package. Once they are cooked put them on one side of the salmon in the pan. Place uncooked asparagus on the other side of the of the salmon. Drizzle olive oil over both vegetables and sprinkle with garlic salt. Sprinkle your salmon with salt, pepper, garlic salt, and fish seasoning. Cut your butter into small pieces and place it on top of salmon. Bake at 400 degrees F for 20 minutes, or until cooked through. 0 Response to "EASY BAKED SALMON"